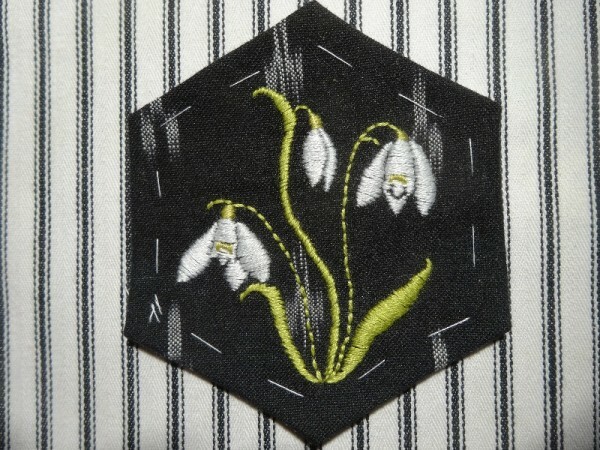 The snowdrop belongs to the genus Galanthus from the Greek gala meaning milk and anthos meaning flower. In spite of it seeming such an English flower, it originates from the more southern and eastern parts of Europe and was possibly introduced by the Romans. Some say that soldiers in the Crimea were so delighted by them that they dug up the bulbs and brought them back to be planted in their own gardens – a sweet but I think unlikely story for any but the odd plant hunting soldier, especially as the Crimean snowdrop is a bigger plant (and therefore fatter bulb) growing to about 12″/30 cm, which is more than twice the size of any snowdrop I’ve ever seen. At the moment I’ve not completed much embroidery as there’s been lots of admin and toing and froing, in part because my bank account was hacked into in New York (!) Thanks to my frugal pattern of spending only one of the 6 or 7 attempts to withdraw money was honoured and the bank has reimbursed even that. (I have my suspicions about a ticket machine on Paddington Station which asked for my pin number twice). Then the cable to charge my Apple Mac stopped working and I discovered I had hardly any yellow embroidery cottons just as I’d sketched out a little group of primroses. But at least one trip to Reading has sorted out the latter two problems, even if the cable for my Apple has set me back £65 (I hazarded a guess of £40, while the vicar opted for £35 with a vague feeling that I was nearer.) So, just a simple out of season snowdrop finished for this post.